Here’s a quick sweet potato recipe that you’ll want to keep making long after the Thanksgiving leftovers are gone. Peel and cube a couple of pounds of sweet potatoes and bring to a boil in 1 ½ cups of salted water then cover and simmer for about ten minutes. In the meantime toast a half cup of unsweetened shredded coconut in a sauté pan over medium heat, stirring constantly so as not to burn then set aside. 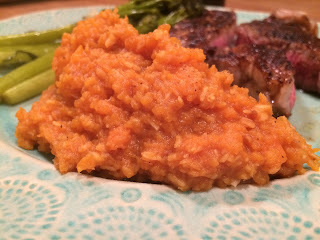 Once your sweet potatoes are tender mash them coarsely and add the coconut, a couple heaping tablespoons of vindaloo or your favorite curry paste, two minced garlic cloves, and some salt and cayenne pepper to taste. Simmer and stir for another five minutes before serving.